According to the Chinese lunar calendar, on February 19, we entered the Year of the Goat. The Chinese zodiac is a generous subject that offers endless possibilities for craftsmen of all walks. Watchmakers are no different, there are more and more that are jumping on this occasion, to create timepieces inspired by the animal sign of the new lunar year. The fact that these pieces are clearly destined to conquer the Asian market, it doesn’t take away from their importance for collectors all over the world. Let’s take a look at eight pieces that honour the Year of the Wood Goat. Arnold & Son hand painted HM Goats, limited to eight pieces and powered by the highly decorated hand-wound A&S1001. 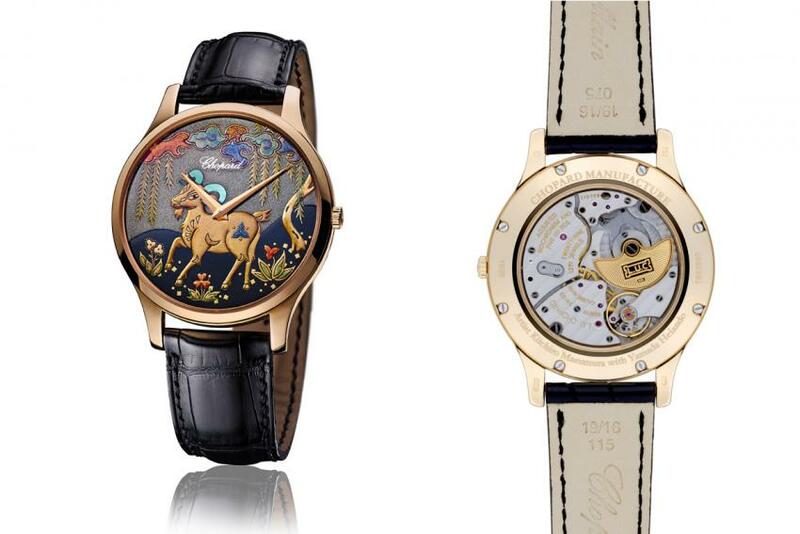 Part of the Royal Collection, the HM Goat by Arnold & Son is beautiful example of Haute Horlogerie inspired by the Chinese art of wash painting. 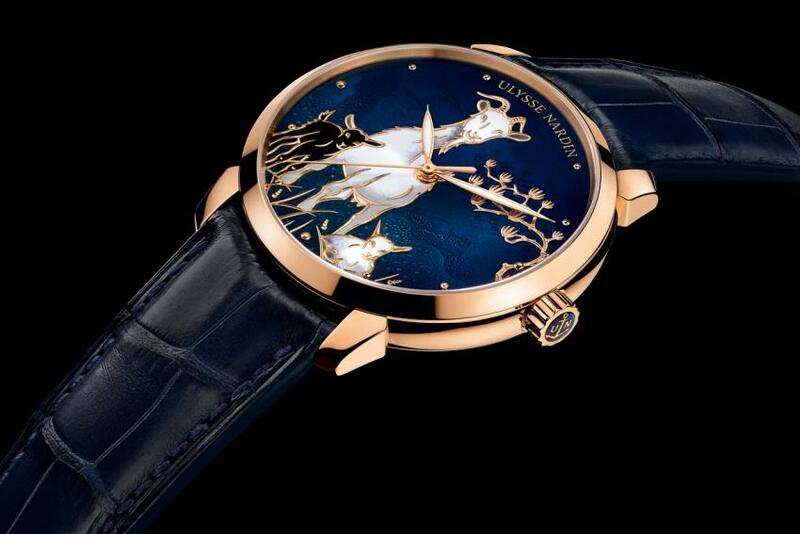 The white, mother-of-pearl dial features a hand-painted miniature of a family of goats feeding on leaves. 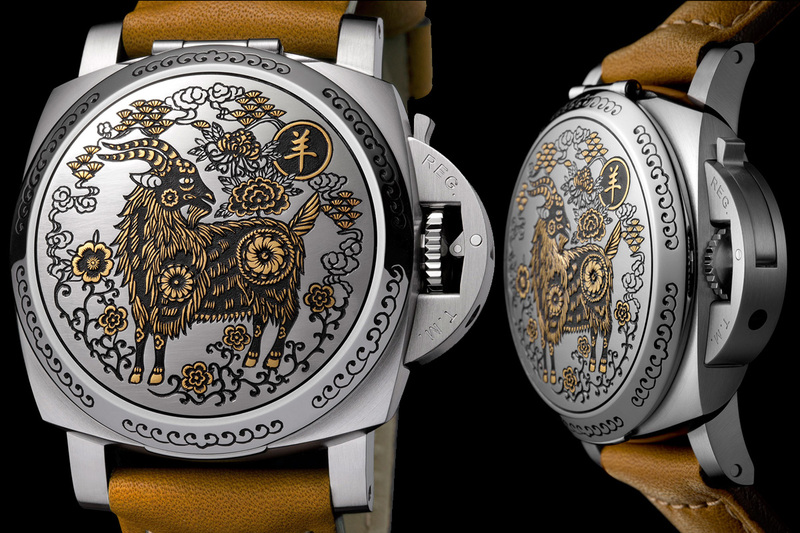 Just as the earlier Arnold & Son pieces inspired by the Chinese zodiac, the HM Goat too is powered by the hand-wound A&S1001 caliber. Behind its apparently basic hour and minutes function, the nickel-silver A&S1001 features Haute-Horlogerie finishing: hand-chamfered bridges with polished edges, fine circular graining and Côtes de Genève rayonnantes, blued screws with bevelled and mirror-polished heads. As the goat is the eight animal sign in the Chinese zodiac, this piece is limited to eight pieces, a lucky number in the Chinese culture. Once again Chopard turns to Urushi, a traditional Japanese lacquerwork, to handcraft the dial of this new zodiac watch. The scene depicts a serene goat, viewed from the side. Portrayed on a bed of flowers beneath colourful stylised clouds, it inspires a sense of merriment and tranquillity. As traditionally represented in the Chinese zodiac, the goat is a peaceful creature, even if it cannot bear injustice, which it is always keen to oppose. Endowed with a creative rather than a belligerent personality, it draws upon art to assert its point of view. Easy-going and generous by nature, it is the bearer of soothing virtues and heralds a sense of harmony associated with values relating to the land and to family. This 18-carat rose gold or white gold L.U.C XP is an elegant ultra-thin piece, measuring 39.5 mm in diameter and 6.8 mm in thickness. It is powered by the automatic L.U.C 96.17-L, visible through the sapphire case-back. While this watch is not inspired uniquely by the Year of the Goat, I have to present it here as I feel it’s a very important piece of Frederic Constant, as a proof of horological excellence. The Zodiac 24H, is following the Chinese way of dividing the day into 12 periods, represented by the 12 Chinese zodiac signs. Each period is equivalent to two western hours and is evenly divided into eight quarters. The hour hand takes a turn and runs 24 hours and the minute hand turns a circle and runs 120 minutes. On the whole dial plate, the scales of the twelve terrestrial branches replace the Arabic from 1 to 12 or Roman numerals; the outer ring is evenly divided into eight scales including the original quarter, original first quarter, original second quarter, original third quarter, positive quarter, positive first quarter, positive second quarter and positive third quarter. The position of the six o’clock is marked the “year of goat”, and all Chinese characters are showed in small seal script. It took Frederique Constant two years to develop the in-house calibre FC-724, which is the 16th manufacture movement developed by Frederique Constant. The 24-hour full-automatic movement is decorated with the Perlage & Circular Côtes de Genève and is inset with 26 gems. Stainless steel or rose gold plated steel, the Zodiac 24H is limited to 888 pieces each and it is available globally at Frederique Constant dealers. 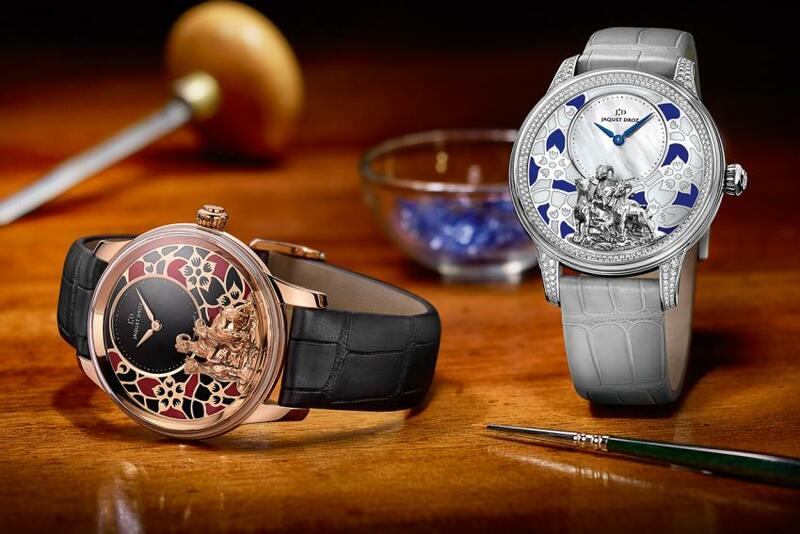 The Year of the Goat, a symbol of creativity has inspired the artisans of Jaquet Droz to propose two Petit Heure models. The stylized dial evoking a motif of plum blossom, one of the four noble flowers that featured in Chinese iconography over 1,600 years ago, is the backdrop for three miniature gold relief applique goats on the top of a mountain. Limited to 28 pieces each, they are powered by the automatic Jaquet Droz 2653, oscillating at 28,800 b.p.h. and offering a power reserve of 68 hours. 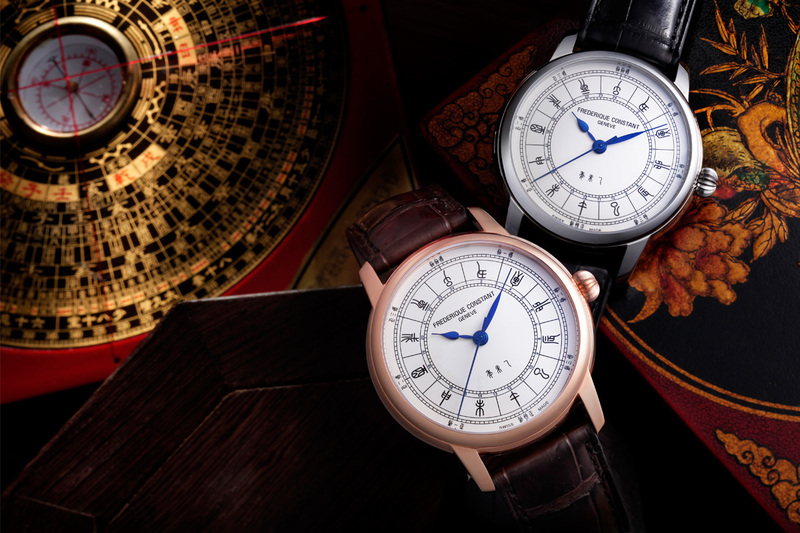 The Luminor 1950 Sealand Year of the Goat is the first of its kind using the Luminor 1950 case. The flip cover is decorated with gold-inlaid engraving, the same technique they’ve used for the other pieces in the Chinese Zodiac collection. Not only the high end brands that would remember the Chinese New Year, Swatch too has a special edition model, released each year, inspired by the Chinese zodiac. 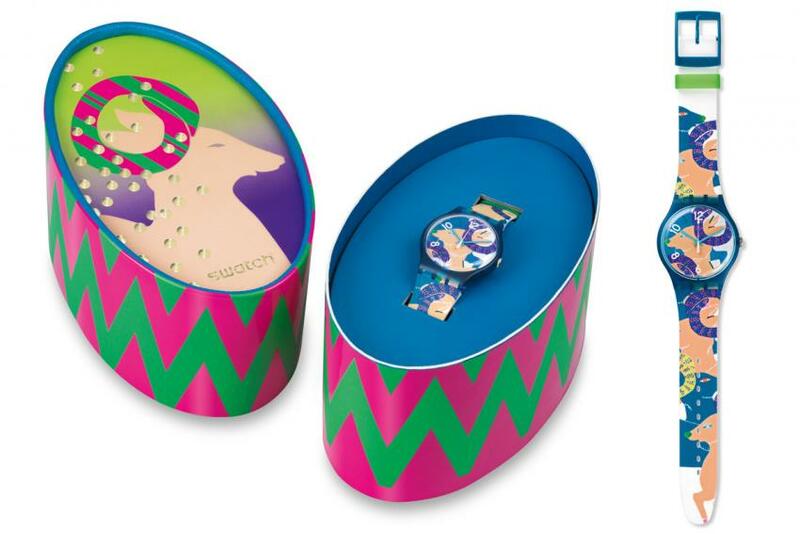 Typical of Swatch, this is a very colourful model, presented in Special Packaging. With the goat from the watch featured on the top of an oval cardboard box with a zigzag pink and green triangle pattern on the sides. Shiny gold dots swirl about the goat’s head, surely a sign of wealth, prosperity, and good fortune in the year ahead! 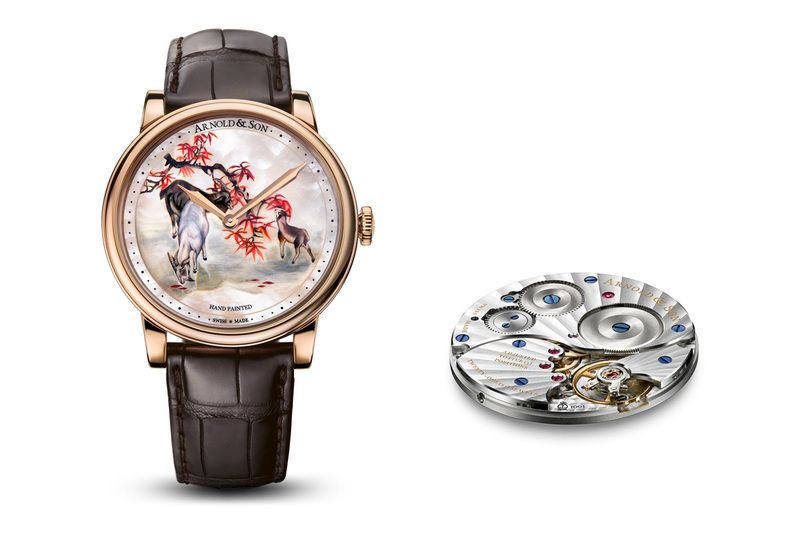 Ulysse Nardin celebrates the eight animal of the Chinese zodiac with an enamel champlevé creation. In this technique, cells are carved with a chisel directly on the watch dial and filled with enamel; the colour palette is generated with different metallic oxides. The dial is then heated until the enamel melts. Limited to 88 pieces, The Year of the Goat is powered by the automatic, COSC-certified UN-815 movement, visible through the sapphire crystal case-back. 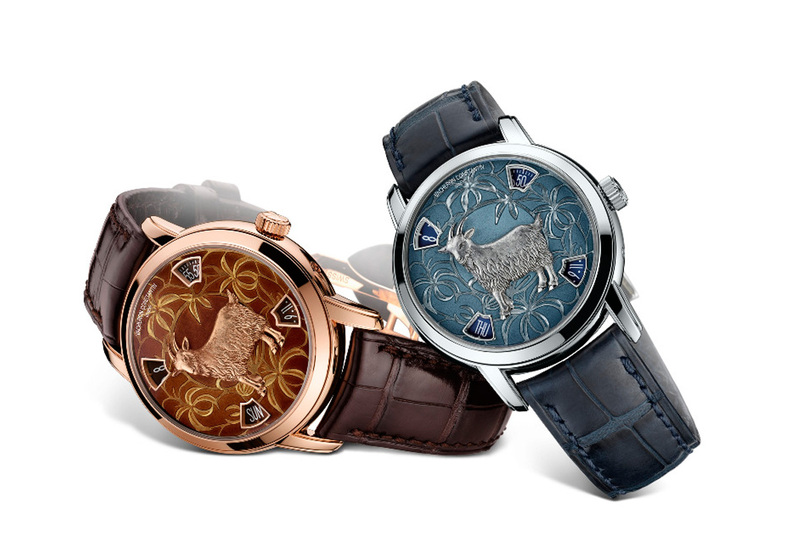 Vacheron Constantin presented two new models in its The Legend of the Chinese Zodiac collection, featuring enamelling and engraving. The leaf motif appearing on the dial and stemming from classic Chinese iconography, is etched directly in the metal. The pattern remains semi-embedded and stands out from its gold base by a subtle stage-setting of variously accentuated reliefs creating a depth effect. The raised honeysuckle flowers appear to be floating over the dial. With the goat engraving, on which the details of the fleece measure a mere fraction of a millimetre, the artisan provides a tangible expression of the artistic vision behind this creation. The goat is delicately applied to the centre of the dial, exuding a sense of calm and serenity through the sapphire crystal. They are limited to 12 pieces each.